It's the 09/09/09, marukyuu's day. As you can see, Cirno (--> [link] ) is the STRONGEST. Well....she is the strongest everyday, but today she is even more strongest. 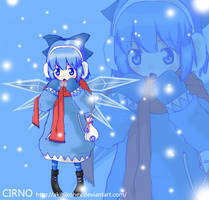 I love Cirno, especially in your style! are you sure that you drew this picture? It says Mio on the bottom of the drawing. I remember seeing this picture from a Japanese website. Also you can see it was uploaded here way before than it was on Pixiv! It's so cute and adorable Her facial expression is wonderful, along with her two fingers salute! Et au passage, merci beaucoup pour le watch! T3T, I find it sad that I learned about the existence of Touhou 2 months after Cirno Day. Oh... that's bad... now you have to wait for 100 years. she is da strongest! & so is this picture! Cute Cirno! Eye'm using Mikuru's BEAM! PEW PEW! I find myself to be a farily macho guy...but this picture sooooooo CUTE! Ca me plairai bien aussi d'en faire une avec toi, même si je n'ai pas énormément de temps dispo. Je ferais une colo au traditionnel par contre, c'est plus amusant et rapide. Sinon je suis partante pour du Tales of Symphonia. J'ai toujours bien aimé le personnage, de Presea, je ne sais pas de ton coté. alors oki pour les pokémon Lixy (shiny avec scarf) et kaiminus ? WAooooo trop joulie mio =3 elle a une super expression j'adore !! Alors tu es rentré à Eurasiam? j'ai plus de nouvelle je m'inquiète tu as changé de numéro de télé hone??? bientôt ton anniverssaire tu veut quoi comme dessin ? thanks. happy cirno day to you too!